A bar is usually one of the main socialising points at your event. If you fancy something a bit special instead of a simple table and cloth, get in touch. We have many different bars, bar sections, round bars, square bars, stainless steel bars, mirrored bars and even ice bars to suit any occasion or venue. 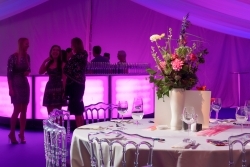 Our standard white gloss down-lit bars can be supplied in almost any colour and our LED colour changing bars can synchronise with each other and the music of your event if desired. More importantly they provide a suitable working area for professional bar staff and cocktail flarers for ease and speed of service. 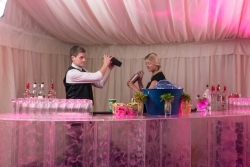 We also offer round bars and oval bars for hire all conveniently located from our hire depot in Oxfordshire and can also provide bar staff and cocktail flarers for your event. All of our bars can be installed almost anywhere and most of them are modular which means they can be joined together. We can also brand wrap and customise most of our mobile bars with your company or event logo or theme as well as providing experienced bar staff, cocktail flarers, waiters, waitresses and glass collectors. Don't forget the all important bar furniture to compliment your bar, please see our hire section or enquire for more details.